I had not yet investigated the new portions of downtown Rockville, so I was happy to be invited out for a sushi luncheon here. Sushi Damo is thoroughly modern, with a stark neutral décor, black and white with touches of orange. A birch-branch thicket serves as art along one wall. Hot tea was served in a rough earthenware cup with swirling ridges on the sides that felt pleasant to the touch. The lunch special that day offered two courses for $10, soup and a bento box. The miso soup was a welcome dose of warmth on a chilly day, but it was a little bland. I have a child-like admiration for bento, the pretty little treats arranged like jewels in a fancy lacquered box. 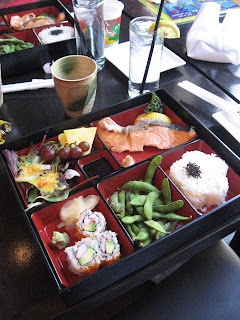 This box contained salmon teriyaki, a green salad with grapes and pineapple, rice molded in a flower shape and sprinkled with black sesame seeds, salted steamed edamame, and California roll (sushi rice wrapped around crab stick, cucumber and avocado). Everything was tasty and attractive to the eye. 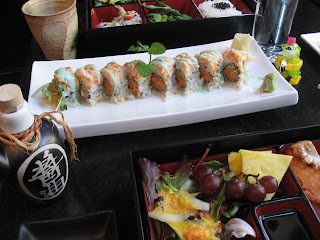 One of the special rolls on the menu that day had spicy crunchy salmon on the inside and lobster salad on the outside. The rolls were drizzled with a vivid blue-green sauce. My friend and I spent some time speculating about what ingredient might produce that vivid hue, and whether or not it would be something that we wished to eat. To our relief, the server described the dressing as “sweet wasabi,” made from wasabi paste, mayonnaise, and a touch of blue Curacao. Sushi Damo is a spin-off of a Japanese restaurant in midtown Manhattan. Chef Takashi Okamura was previously at Makoto, a tiny gem of a restaurant renowed for its seasonal kaiseki menus. Sushi Damo has a good selection of sakes, martinis, saketinis and other mixed drinks. Other reviews suggest that it is a popular night-time destination. There's a large movie theater within walking distance -- sounds like a good plan for a Saturday night. Politics & Prose Bookstore - buy local! © Lisa M. Orange 2014. Permission to excerpt or republish with proper attribution & link back. Awesome Inc. theme. Theme images by molotovcoketail. Powered by Blogger.